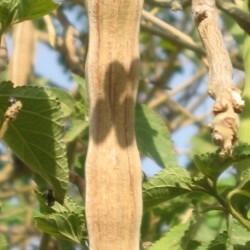 The Drumstick or Horseradish Tree is an erect, fast-growing tree with open branches and a graceful appearance reaching up to 10 metres in height. 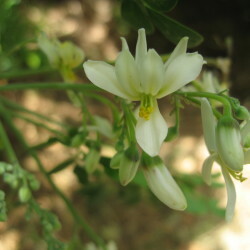 Native to India, it is characterised by its thick, dark corky grey bark, delicate foliage and beautiful, fragrant flowers. 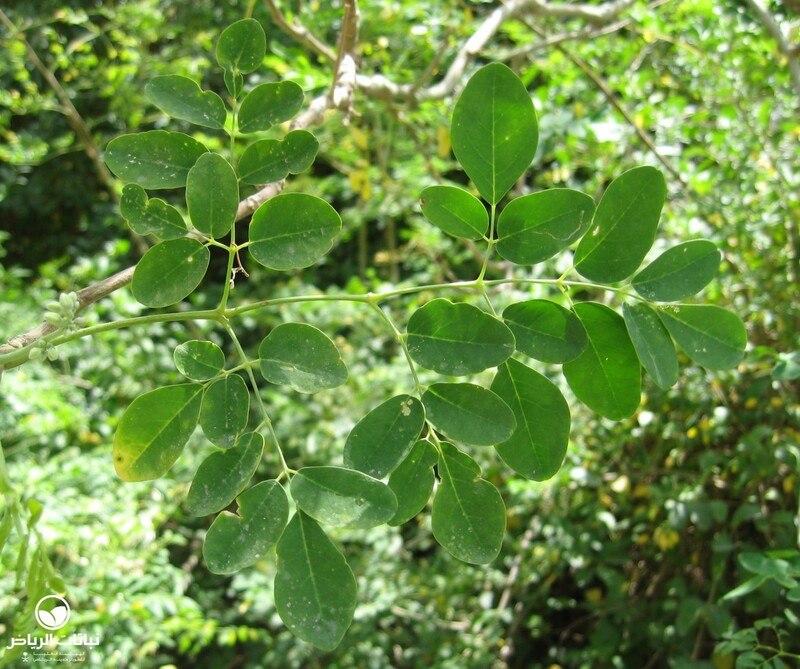 The distinctive, bipinnate leaves up to 40 cm long have widely spaced, oval, clear green leaflets on short stalks. Attractive whitish-yellow, highly scented flowers are borne in loose clusters covering the whole tree in spring and early autumn. The fruit, up to 50 cm long, is a bright-green, ridged pod containing many seeds, which are a popular ingredient in curries. The tree grows best on a dry sandy soil and has a high drought resistance. In Arriyadh, it requires regular irrigation and a sheltered microclimate with a humid atmosphere. 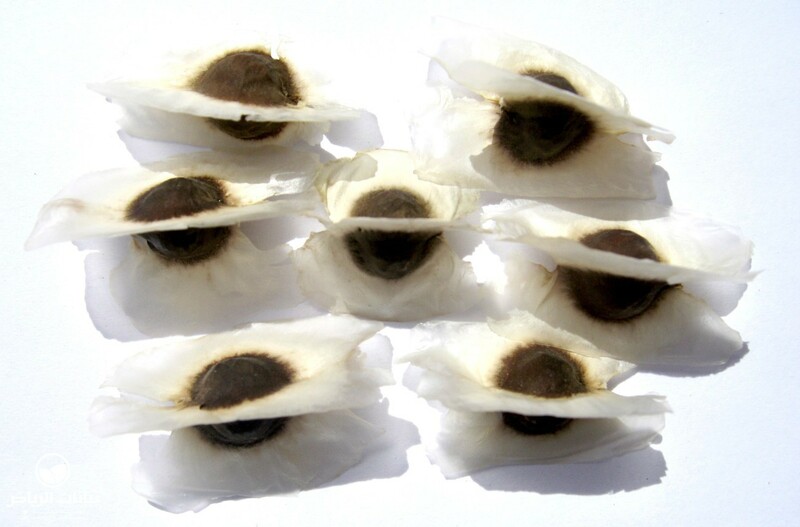 Propagation is from seed and cuttings. The Horseradish Tree is useful in many ways: its name is derived from the roots, which taste like horseradish, and the seeds yield oil for machinery, salad oil and soaps. The bark contains a coarse fibre for making mats, paper and cordage. The branches are used for fodder. 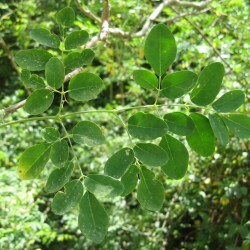 M. oleifera makes an ideal shade tree for courtyards, patios and small gardens. Undemanding, it requires careful pruning: branches can be brittle and are planted as a living fence. It is not susceptible to pests or diseases. 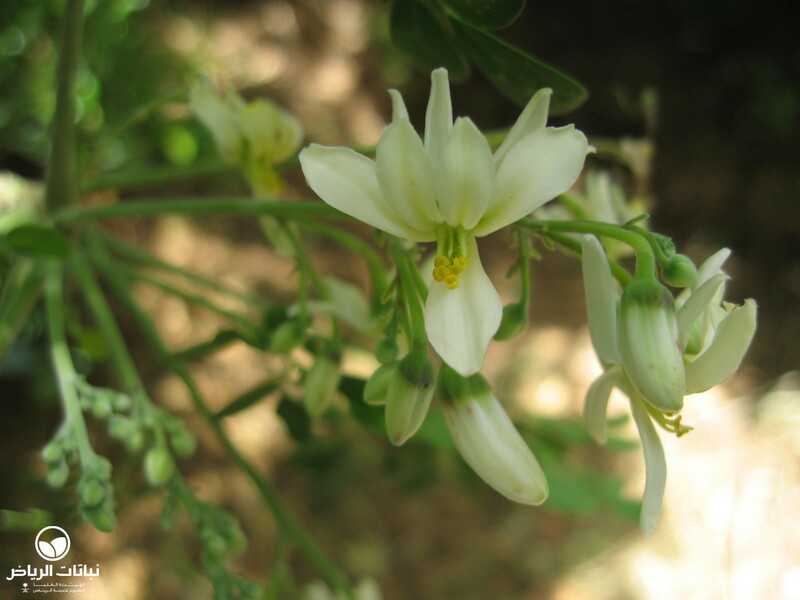 A wild shrub form growing in rocky wadi sides is M. peregrina (al ban in Arabic): up to 3 metres high, it has profuse flowers, is drought-tolerant and has good potential for garden cultivation.